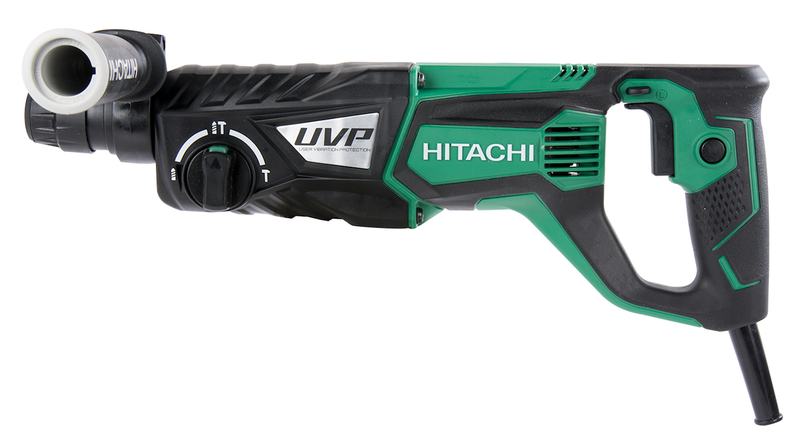 Hitachi sources report these tools are ideal for drilling holes for anchors, drilling concrete for trade installations and small chipping jobs. They deliver higher durability* than previous models, and also achieve faster drilling speed** to improve efficiency on the jobsite. Higher durability is achieved by incorporating similar hammering mechanisms as Hitachi’s larger hammer line with three specific improvements. For one, the hammering mechanism now features an air channel system that adds more volume to the air cushion, which reduces wear and damage inside the cylinder. Secondly, a ball bearing has been used to replace the brass bushing that supports the front end of the second shaft to prevent a shortage of grease, and reduce the generation of heat that could damage the gear cover. Thirdly, a new internal pressure control mechanism provides smooth airflow; in or out of the gear cover to stabilize and ensure hammering action. Also, sealed to prevent grease leakage so they don’t lack lubrication, the ￼￼￼￼￼￼￼￼￼DH26PF and DH28PFY exhibit prolonged tool life and unmatched durability. Faster drilling speed is managed by combining the powerful motors and newly optimized hammering mechanisms. The DH26PF 1-inch SDS Plus rotary hammer features a powerful 7.5 Amp motor that produces 2.4 ft-lbs of impact energy and the DH28PFY 1-1/8-inch SDS-plus rotary bammer delivers an 8-amp motor that produces a formidable 2.5 ft-lbs of impact energy. Both offer no-load impact speeds of 0-1,100 RPM and impact rates of 0-4,300 IPM. 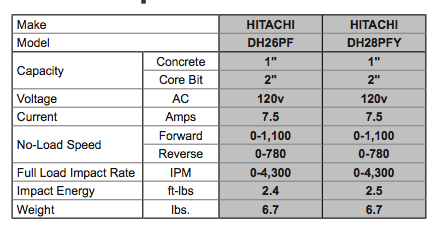 The DH28PFY additionally offers Hitachi’s patented User Vibration Protection (UVP) technology, which is one of the most advanced vibration protection systems available to the market to date. Hitachi’s technology implements an internal counterbalance mechanism that moves in the opposite direction of the main body to reduce the vibration felt from concrete drilling or chiseling applications. This results in significantly reduced vibration transfer to the user, and can reduce the risk of developing a vibration- related injury due to prolonged exposure. Both rotary hammers are equipped with a “D” shaped rear handle for better control in overhead applications. They deliver three modes of operation: drilling only, hammering only and hammer drilling, plus an angle adjustment position to change the chisel bit to different angles, that is now controlled by a larger, easy-to-use (even with gloves) mode selector dial located on the side of the tool for easier accessibility. A lock-on speed button allows for continuous operation, reducing end-user fatigue. An improved, adjustable 360° side handle is now double molded for comfortable operation, while providing better control. The side handle can be removed when working in tight spaces for better maneuverability. The side handle also includes a depth gauge for consistent drilling depths.